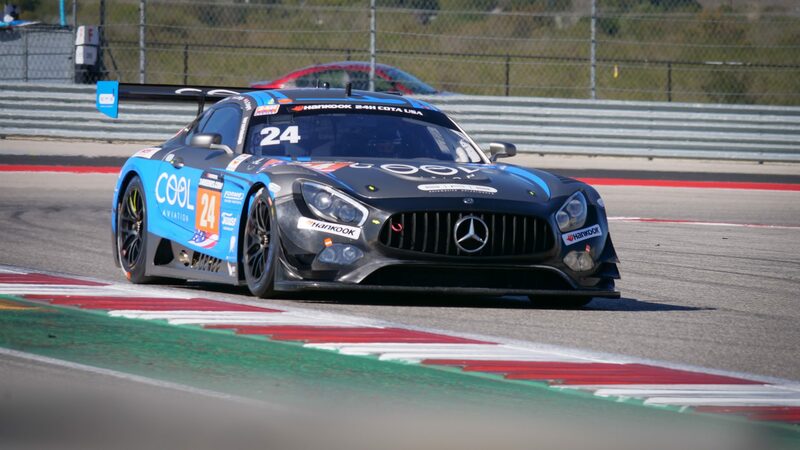 While in Paul Ricard the first preparations started for the racing season 2019, on the other half of the world the last race of the racing season 2018 awaits the team of SPS automotive performance: At the Hankook 24h race in the USA, on the Circuits of the Americas (COTA), the SPS team with the Cool Aviation Mercedes-AMG GT3 and the drivers Alexandre Coigny, Richard Feller and Antonin Borga was about to start. This race means great a last great highlight for the team from Willsbach in the year 2018. After a good Qualifying with a lap time of 2:06.833, Antonin Borgia reached starting position 2 in the AM class and P5 in the overall rating. A very good starting basis for the 24h race, which began on Saturday at 10:30am in Texas. After the half of the race, they’ve got a so called “Intervention break”, which means, that the race was interrupted until 7:15am. All of the participants were stopped at the starting/finishing line and until the race is restarted, nobody is allowed to do any work on the cars! After the restart and a racing time of over 15 hours, Alexandre Coigny was in the cockpit of the SPS GT3 on currently P2 in the class and P4 overall. The SPS Mercedes was one lap behind the leading car in the AM-class. But the gap to the car behind was 7 laps, so the risk to get caught up by the car on position 5 was relatively small. Also in the final part of the race the drivers showed a great performance and Alexandre Coigny, Richard Feller and Antonin Borga finished the 24 hour race in COTA / USA on position 2 in the AM class and P4 in the overall class rating. Another podium for the SPS Mercedes AMG GT3 and a nice finish for a very good racing season 2018. Furthermore the SPS team reached after this outstanding season the position 3 in the “Championship of the Continents” in the class A6! Many thanks again to the whole team and the drivers for the wonderful season! The Team of SPS automotive performance is already deep in the preparations for the racing season 2019 and is looking forward to lots of new race-challenges coming up.